The abbreviation PR is most commonly known as “Public Relations”. Well, not so in Online Marketing. In the world of online marketing, PR stands for the link algorithm PageRank named after one of Google’s’ founders – Larry Page. It is used by the Google search engine to “measure” the relative importance of a website within its set of hyperlinked pages. You probably know this question: “How pretty am I on a scale of 1 to 10?” If you haven’t said it yourself, you might have heard it from a girlfriend or spouse. If not that, you probably have heard it in one of the several movies that use this particular line. Rating something (or someone) on a scale from 1 to 10 is common. In simple terms, the Google PageRank does the same with websites. The basis for PR calculations is the assumption that every website on the World Wide Web has certain importance which is indicated by the PageRank (0 being the least and 10 being the most important). 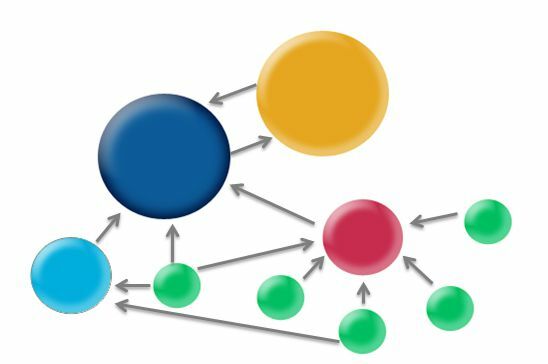 The PageRank is calculated by the number and value of incoming links to a website. Initially, one link from a site equaled one vote for the site that it was linked to. However, later versions of the PageRank set 0.25 as the initial value for a new website (based on an assumed probability distribution between 0 and 1). Before you start collecting links from several different pages, you should know the value every link. The value of inbound links is determined by the amount of outbound links from the linking site and its PR. That is, because the PageRank of the linking site is divided by the total number of outbound links the page has. A page that is linked to several relatively important websites (those with high PageRank themselves) has value, while a website that has no incoming links is considered unimportant. The more the incoming links from high value websites you get, the better it is for your website. To simplify that process, let’s look at a universe with 4 websites only (A, B, C, D). The PageRank of D equals the sum of the PR of the linking website(s) divided by their outgoing links. From this example, you see that links from pages with a high PR and less outgoing links are worth more than many links from low PR pages with thousands of outgoing links. From the above example, you can see that your link value decreases with the amount of links you place. Some websites have many incoming links, but they don’t link to other pages themselves. Those are considered “sinks”. According to the theory of the random surfer (someone who clicks through the internet randomly), everyone would eventually somehow end up at a sink-website. To balance this phenomenon and in order to be fair to non-sink pages, the PR of websites without outbound links is distributed evenly among all other websites. How should a great link profile look? Based on the PageRank, how would a good link profile look like? Based on PR only, you would go for high value, high PR websites that have only few outgoing links. Obviously, this fact will increase the difficulty of getting them to link to you. Based on PR only, this would be the best way to go. However, there are more factors to be considered in building a great link profile. Especially after Google algorithm updates “Penguin” and “Panda”. It all comes down to building a natural link profile. You should try to avoid anything that you do just for SEO purposes, but that wouldn’t come natural to a non-SEO. Instead, use natural link texts and sources that would naturally be related to your site. Also include all types of backlinks (not just high PR backlinks, but also low PR ones). How to check Page Rank in Bulk? Do let me know if you still have any query regarding Page rank calculation. Use the comment section below so we can have a discussion. This was good. There are some interesting points made on Wikipedia on how pagerank is calculated as well. I really do like your post here though. It is very helpful. Google really love these types of site. Have a calculate love meter between them. we all know the formula of how to calculate pagerank but i think we didn’t try this out….. Although most of us know the value of creating links for improved pagerank purposes, still many bloggers fail to follow the system. I am one of them actually as I have been surfing and reading ideas about creating useful backlinks to my site. Most of the posts offer the same solution so I have a pretty good idea on how to do it. But still, I stick on my basic method which is basically just to publish content on a regular basis. Not doing enough for me I guess as I have to still see improvement in pagerank lol. Thanks for the info on this post. Google has not updated page rank from long time and will not be updating anymore according to one of their official. So PR algo will not be crucial factor.Is that so? I am new reader to your blog,my friend tole me that if you want to learn blogging from the core than shoutmeloud is one of the best option.thanxx for telling the importance of long tail keyword and providing some useful tool.i will start with google auto search as i find it more helpful.